Following a consultation, fees for HGV and PSV annual tests will fall from 1 October 2014 for customers who use ATF sites. Over 80% of all annual tests take place at private ATF sites. Customers who use these sites will no longer have to contribute to the cost of DVSA facilities. This means that test costs will fall by an average of around 3.5%. However at DVSA sites, where the cost of delivering tests is higher, fees will increase by an average of around 18.5%. 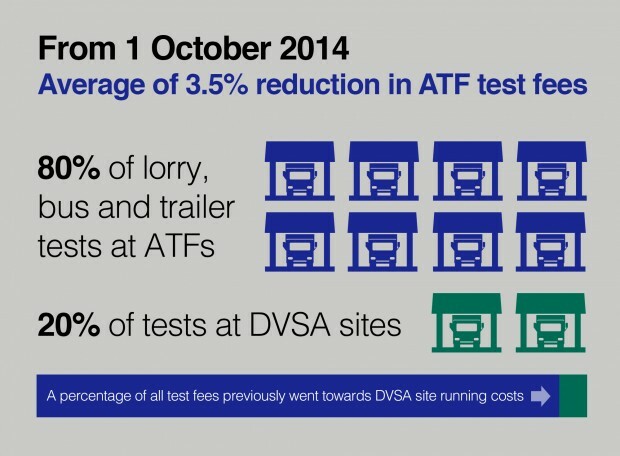 DVSA plans to provide at least 85% of annual tests from ATFs by 31 March 2015. In addition to the changes to test fees, DVSA is also adjusting fees for HGV and PSV operator licences. These will rise by 1% to cover the running costs associated with the National Register of licensed operators. Should I be failing defective stop lamps? Do test stations have the discretion to pass historic American vehicles? Why were shock absorbers removed from the MOT test? Check type-approval before you buy! Do you think classic vehicles should be exempt from annual test? Indicator tell-tale lamp not working? Does removing a passenger seat result in a fail?